All things being equal, Gov. Peter Shumlin and Lt. Gov. Phil Scott would cruise to victory if November's election were held today. Or, at least, if it was held two weeks ago, when the Castleton Polling Institute wrapped up this fall's most scientific survey of Vermont voters. The poll, commissioned by WCAX-TV, showed that Shumlin's approval ratings have softened considerably in the past two years. Nearly as many respondents disapprove of the gov's job performance (41 percent) as approve of it (45 percent) — a difference just outside the poll's 3.8 percent margin of error. But it also showed Libertarian Dan Feliciano pulling 6 percent of the vote from Republican Scott Milne, leaving the GOP candidate with 35 percent to Shumlin's 47. "I kept hearing the lieutenant governor's race was really going to be the one to watch," he says. "So the margin there was much greater than I expected." Of course, it's important to remember that in campaigns, all things are certainly not equal — and polls are just a snapshot in time. Especially in a low-turnout election, as nearly everyone expects this one to be, candidates and parties can really move the needle with sophisticated voter-targeting, aggressive field operations and a solid get-out-the-vote program. That's where the Vermont Democratic Party has a serious edge. In recent months, the VDP has staffed up from five year-round employees to 15 full-timers, according to executive director Julia Barnes. Ten of them work under field director Josh Massey at temporary offices scattered throughout the state, coordinating daily phone-banking and weekly canvasses. Since July 2012, when he joined the party, data director John Faas has been running the numbers to figure out which reliable Democrats need a nudge to go to the polls. For the past month, the party has been focusing on the ever-growing number of voters who request absentee ballots. In 2012, more than 76,000 Vermonters — a quarter of the state's 302,000 voters — did so. "It's a good way to bank as many votes as possible as early as possible," Barnes says. But not everything is rosy for the Dems. Without President Barack Obama, Sen. Patrick Leahy (D-Vt.) or Sen. Bernie Sanders (I-Vt.) on the ballot, fewer wishy-washy Democrats will bother going to the polls. In 2002, the last time Vermont lacked both a presidential and a senatorial contest, just 233,000 people turned out to vote, according to the Secretary of State's Office — and that year featured a competitive gubernatorial race. "There's nothing motivating the left right now, and I think that's an opportunity," says Jeff Bartley, the Vermont Republican Party's so-called "victory campaign director." "There's a lot of dissatisfaction with Peter Shumlin, and nobody at the top of the ticket driving turnout. If we can get out our guys, I think we might pick up more seats than people think we might." 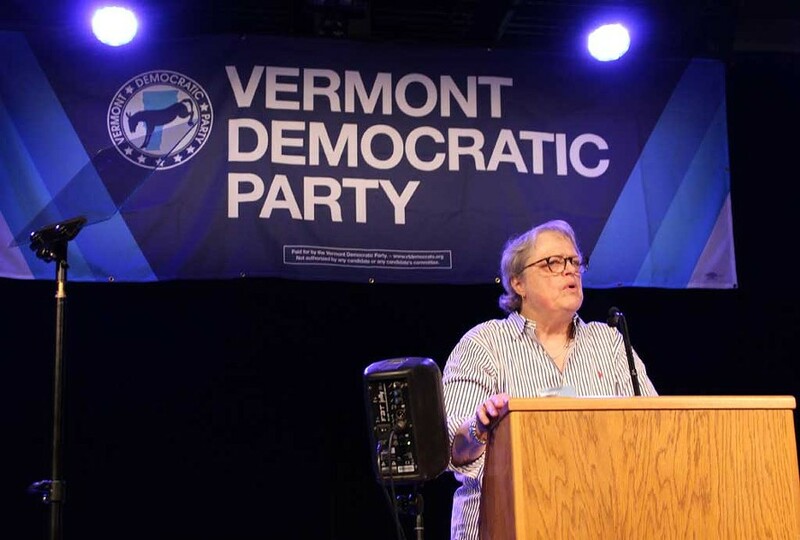 Both Bartley and Vermont Progressive Party chairwoman Emma Mulvaney-Stanak concede that their party organizations don't come close to matching the Dems'. Mulvaney-Stanak jokes that her party's field office consists of elections director Kelly Mangan's car, while Bartley says the Vermont GOP has just three full-time staffers: operations director Marty Searight, fundraiser Susie Hudson and himself. But Mulvaney-Stanak insists the Progs have an enthusiasm advantage — with 19 legislative candidates, plus Corren and two other statewide candidates on the ballot. And Bartley maintains that Republicans are getting their organizational act together. "We know as a party we've been terrible at getting out the vote in the past. We've put a lot of time and energy into data collection," he says. "It's like breaking a paradigm." The Democrats' organizational advantage will certainly help Shumlin keep his conservative competitors at bay, but it's less clear how much it'll benefit Corren — a longtime Progressive who won the Democratic nomination as a write-in candidate in the August primary. Because he qualified for up to $200,000 in public financing, Corren can't receive in-kind donations from political parties — so he's been left out of the Democrats' mailers and call scripts. And even though Dems are far more likely than independents or Republicans to back Corren, the Castleton poll showed that nearly a third of the Democrats surveyed support the Republican incumbent. Barely half were behind Corren, while nearly 20 percent were undecided. Those yet to make up their minds — 8 percent in the governor's race and 15 percent in the LG contest, according to Castleton — may well be persuaded by the increasing number of television advertisements gracing the airwaves. Shumlin, the biggest spender, dropped another $80,000 on ads last week — bringing his TV total to $375,000 — while Milne hasn't run a single commercial since the primary. Scott is outspending Corren on air $55,000 to $30,000. At least one out-of-state organization is also playing ball. The Republican State Leadership Committee invested $143,000 in a generic, pro-GOP TV ad last week — plus another $100,000 on radio, postcards and online ads promoting Republican state Senate candidates in Franklin, Rutland, Washington and Orange counties. Major donors to the RSLC, which has also cut a $6,000 check to Scott's campaign, include tobacco giant Reynolds American ($1.1 million), the U.S. Chamber of Commerce ($1.1 million) and Koch Industries ($461,000) — the Kansas conglomerate owned by conservative bogeymen Charles and David Koch. Asked if the organization will keep investing in deep-blue Vermont, spokeswoman Jill Bader says, "We don't give away our playbook, but we think that people who are watching races closely will see continued activity [in the four Senate districts], with the possibility of elsewhere, as well." Just before Seven Days went to press last week, the Burlington Free Press announced that veteran reporter Sam Hemingway would retire after 37 years at the paper. Hours later, the other shoe dropped: In a note to readers posted later that night, executive editor Mike Townsend announced somewhat cryptically that his reporters and editors would have to reapply for their jobs. "With systemic changes in the media business in recent years including changes in approach, format and staff size, we are redefining journalism jobs for the future and our vibrant website, BurlingtonFreePress.com," Townsend wrote near the bottom of the piece. "During the next several weeks, the staff will apply for these jobs with new expectations. We expect time for adaption to the change in structure." Townsend declined to elaborate and rebuffed questions from the media. "I don't talk to you guys," he told Seven Days last Wednesday after the Freeps' gubernatorial debate. "I'm old-fashioned when it comes to competition." Sources inside the Free Press' Bank Street headquarters have filled in at least some of the gaps. They say they were informed last Tuesday that 22 out of 26 editorial staffers must apply for new jobs with different titles. According to a document obtained by Seven Days, applications are due today, though sources say the computer system through which staffers are supposed to apply was malfunctioning in recent days. Interviews are to be conducted next week, according to the document, and final decisions will be announced the week of October 27. Four current employees are exempt from the process: Townsend, associate editor Adam Silverman, news editor Clover Whitham and veteran reporter Mike Donoghue. How many positions will be eliminated isn't as clear. We've heard between two and four, though one source cautioned that the bosses have provided conflicting information. Other papers owned by Virginia-based Gannett Company, Inc., have been expected to shed 15 percent from newsroom budgets as this round of layoffs has spread throughout the organization. So it's possible the number of job losses will depend on the salaries of those leaving. Also unclear is whether Hemingway's departure will be counted. A list of new positions obtained by Seven Days provides some clues about the areas in which the Free Press hopes to devote its dwindling resources. The paper plans to rehire four reporters for its "Chittenden team," three for its "watchdog team," and a reporter each for its Green Mountain, Innovate and Savorvore sections. Other available positions include "content coach," "engagement editor," "planning editor" and "audience analyst." Sources say that editors have become increasingly focused on web metrics in recent months. Reporters are expected to monitor the number of clicks their stories receive on a daily basis and rejigger headlines and copy to boost readership. Townsend alluded to the new priority in his note to readers, after praising a story Dan D'Ambrosio wrote about IBM earlier this month. "We can make adjustments instantly as we move along in the cycle of news to elevate a story package by adding more information, tweaking of headline or rewriting a lede," Townsend wrote. "One small change can lift story interest from the bottom to the top of readership, often a matter of nuance. This is how close readers pay attention to the story." Matt Sutkoski, one of 13 employees laid off by the Free Press last August, has been following his former colleagues' story equally closely. He says he's glad he took the hit when he did and relieved he doesn't have to go through the reapplication process. "The day I got laid off, I came home and told my husband, and he basically said, 'Thank God.' It's just the stress level. I didn't even realize," says Sutkoski, who's now juggling several jobs. "You just wanna work for an outfit you're rooting for. In hindsight, I think I stopped rooting for Gannett a little bit while I was working there." In a report last Thursday night on the ongoing trial of accused murderer Allen Prue, WCAX-TV aired a graphic photo of his alleged victim, St. Johnsbury teacher Melissa Jenkins. The photograph, displayed in open court earlier that day, depicted Jenkins as she was found in March 2012 in the Connecticut River. Seconds after the story aired, news anchor Kristin Kelly apologized for the photo's inclusion. Within minutes, the station took to social media to reiterate the apology. "We used a photo in our 6 o'clock report that should NEVER have been used," the station wrote on Facebook. "We are investigating how something so egregious could happen. We are deeply sorry." WCAX news director Anson Tebbetts did not respond to Seven Days' requests for comment last week, but said Monday morning that the station had spent the previous days apologizing to Jenkins' family and friends — and to the court. On Friday, he attended proceedings at Vermont Superior Court in Burlington. The station's "preliminary investigation," Tebbetts said, found that it accidentally aired an earlier version of the piece, before the photo in question had been replaced by another image. "It was never intended to play," he said. "Even when [newsroom staffers] were double-checking it to make sure that wasn't going to air, they were seeing the proper [version]." He said the station was still trying to determine precisely why the wrong version went live and was "still evaluating the personnel issue." "One thing we're going to do from now on: If it's anything remotely sensitive, we're going to make sure we delete the first version, so there's no chance it could be played," he said. Disclosure: WCAX and Seven Days are media partners, and Paul Heintz is an occasional, paid political analyst for WCAX.